Anubis (アヌビス, Anubisu)is the main antagonist in Yu-Gi-Oh! The Movie: Pyramid of Light. 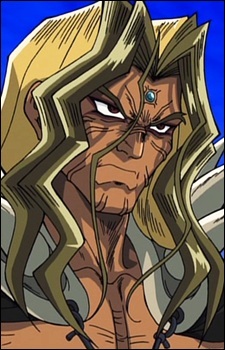 In the English version of the movie, Pharaoh Atem had defeated Anubis a long time ago, only for him to eventually resurface as a after effect of Yugi Muto solving the Millennium Puzzle. To that end, Anubis posseses the King of Light (Kaiba) to defeat the King of Darkness (Dark Yugi) and become ruler of the world. However, when Kaiba regains control, Anubis removes him and personally duels Yugi. However, though he lost the duel, Anubis turns into the King of Destruction and tries to kill his enemies, only to be destoryed by Blue-Eyes Shining Dragon.